Millions of boys have grown up dreaming of becoming a professional ballplayer. For a young Iowa farmboy named Calvin McVey playing ball for a living was the furthest thing from his mind. There were no openly professional ballclubs during his childhood. However, he was to become one of the first to play for pay, a member of the team that forged the longest winning streak in the history of the sport. Calvin Alexander McVey was born near the village of Montrose in Lee County, Iowa, the southeasternmost county in the state, on August 30, 1849. He was a son of Caroline and William McVey, natives of Indiana, who had moved to the Hawkeye State when it was still on the frontier. Iowa had been admitted to the Union less than three years before Calvin was born. William was a farmer, and not a particularly successful one, who moved from place to place in southern Iowa and northern Missouri until he gave up farming and returned to Indiana, where he secured employment as a tax collector and later as a piano tuner. Calvin was first mentioned in the Indianapolis City Directory in 1867 as a student at North Western Christian University and as a piano maker for the Indianapolis Piano Manufacturing Company, an enterprise owned by a relative. As a boy Calvin had been a nimble athlete, known for his cartwheels and handsprings. He had been a capable bare-knuckle pugilist. In Indianapolis Mac, as he was called, was introduced to baseball, which he soon came to love. He played for two different amateur clubs, the Actives and the Westerns. In 1867 the latter club took on the powerful Nationals of Washington, D.C., in a highly publicized match of one of the best teams in the East against the best of the West. McVey’s team lost, but the teenager earned a national reputation as a competitive player. In 1869 A.B. Champion formed the nation’s first club of all openly professional players—the famous Cincinnati Red Stockings. Most of his players were imported from the East. (Only one was a Cincinnati native.) Harry Wright had been a member of the famous Knickerbockers in New York. He came to Cincinnati to play cricket, but Champion named him manager of the Red Stockings. Wright had heard about the exploits of the youngster with the Indianapolis Westerns and signed him to a contract. (Actually William had to sign for his son, as 18-year-old Calvin was considered a minor, too young to sign a legally binding document.) Mac was younger and less experienced than his teammates, and Wright was unsure of the best position for him to play, but he knew the youngster could hit, so he put him in right field. Calvin McVey became the youngest player in professional baseball, the first salaried player born in Iowa, and the first pro born west of the Mississippi River. At 5-feet-9 and 170 pounds, Mac was probably about the size of the average player of his day. He batted and threw right-handed. It is said that he brought his athletic agility with him to the professional ranks, frequently turning flip-flops on the field after his club posted another victory. After defeating a number of Midwestern teams, the Red Stockings took off on a tour of the East on May 31, 1869. To the surprise of many, the Cincinnati club defeated all of its opponents, with only one club making it a close contest. After a game in Washington, where the Red Stockings routed the Nationals, the club was invited to the White House. It was quite a thrill for the 18-year-old erstwhile Iowa farmboy to meet the president of the United States, Ulysses S. Grant. Having defeated all the best teams in the East and the Midwest, the Red Stockings headed for the West Coast. They took a stagecoach from St. Louis to Omaha, with Cal McVey and the manager’s brother George Wright sitting next to the driver. Then they boarded a train for San Francisco, with McVey being a member of the first ballclub ever to travel on the new transcontinental railroad. The Red Stockings demolished all of their opponents in San Francisco. The winning streak continued until June 14, 1870, when the Red Stockings lost in extra innings to the Brooklyn Atlantics. The 1870 census showed Calvin McVey living with his parents in Indianapolis. His occupation was listed as baseballist. Two factions emerged on the team during 1870, divided largely by their attitudes toward drinking and discipline. McVey, the Wright brothers, and Charlie Gould (the team’s only native Cincinnatian) favored teetotaling. Despite all their success on the field, the club was not a money-making proposition. Champion resigned as president, and the club’s directors voted to return to amateur status. In March 1871 the first professional league was formed—the National Association of Professional Base Ball Players (NA). Harry Wright became the captain of the Boston entry, which he named the Red Stockings after the famous Cincinnati club. From Cincinnati he took with him three players – his brother George, Charlie Gould, and Calvin McVey. The fact that Cal was the team’s best hitter was probably the principal reason he was included in this elite group, but Wright’s perception of the youngster’s exemplary character may have played a part in the decision. In his first year in the NA, Cal batted .431 and was runner-up to Levi Meyerle for the league’s first batting title. He was used primarily as a catcher, but logged a few games in right field. Before his major-league career was over, he had played all nine positions, including pitcher. After two seasons in Boston, McVey departed for Baltimore, where at the age of 22, he became the league’s youngest manager. He spent only one year with the Lord Baltimores (or Canaries, as they were sometimes called) before returning to Boston for two more seasons. In 1874 he married a 22-year-old Indiana woman named Abbey. In 1876 and 1877 he played (mostly first base) for the Chicago White Stockings of the newly formed National League. Mac helped the Chicagoans win the first NL pennant, but after two years he was on the move again. This time it was back to Cincinnati, where he played third base for the Reds in 1878 and 1879. He had played nine years in the two leagues, averaging .362 for his five years in the National Association and .328 for his four seasons in the National League. McVey had been impressed with California during his 1869 visit to San Francisco with the Red Stockings, so he moved to West and tried his hand at minor-league ball in the Bay Area. Caroline and William McVey also succumbed to the lure of the Golden State and joined their son in California. They were living in the same household as Abbey and Calvin in Oakland at the time of the 1880 census. In California William worked from time to time in his former occupations of farmer and tax collector. McVey started the 1880 baseball season with Bay City in the California League. He stayed with the club when it jumped to the Pacific League on July 3. Three weeks later the Pacific League folded, and Cal joined the Californias in the California League. He played the last game of the season with the Knickerbockers of San Francisco. In the fall of 1885 he played for an independent club, the Pioneers of San Francisco, and he was with them in April and May of 1886, when the club was in the California League. During various times in the 1880s he played for independent clubs in the Bay Area or in Southern California. Most of the 1890 census schedules, including all those from California, were destroyed by a fire in the Commerce Department Building in January 1923. Voter registration records are the only official guide to Mac’s activities between 1880 and 1900. Of course, women were not allowed to vote at that time, so no account of Abbey’s whereabouts is available. In the 1900 census Calvin was shown as a resident of a boarding house on Powell Street in San Francisco. Although he was listed as married, Abbey was not with him at that time. The 1901 San Francisco City Directory lists Mac as a special policeman, residing at 209 Eddy Street, and also as a watchman at 17 Powell Street. According to John Liepa, a historian in Iowa who has researched McVey’s career, Calvin’s wife was seriously injured and his home destroyed by the calamitous San Francisco Earthquake in 1906. Liepa wrote that McVey was reduced to living in a small shack and depending on charities for food and clothing. In 1908 his address was 139 14th Street in San Francisco; no occupation was given in the city directory. Seven years after the earthquake the ex-ballplayer was working in a mine in Nevada, when a 30-foot fall crippled him. Liepa wrote that despite his injuries McVey was able to work as a night watchman for a lumber company for ten years. (Curiously, the city directory in 1913 named McVey as the manager of San Francisco’s Central Amusement Company.) A former Red Stocking teammate, Doug Allison, petitioned the National League for medical and financial assistance, and minimal aid was provided, but not enough to lift McVey out of economic hardship. A final moment of glory came for Cal McVey in 1919 when he was invited to come to Cincinnati as an honored guest at a celebration of the 50th anniversary of baseball’s first professional team. He proudly rode in a festive parade prior to the opening of the World Series between the Reds and the Chicago White Sox. Calvin Alexander McVey died on August 20, 1926, in San Francisco at the age of 76. His remains were cremated. In 1968 he was inducted posthumously into the Iowa Sports Hall of Fame. The best biographical sketches are by Liepa and Frederick Ivor-Campbell. 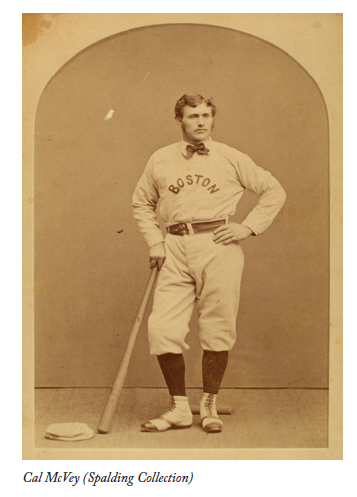 Not many modern baseball fans are familiar with the exploits of Cal McVey, but 19th-century aficionados acknowledge him as one of baseball’s great pioneers. Frederick Ivor-Campbell, “Calvin Alexander McVey,” in Robert L. Tiemann and Mark Rucker, eds., Nineteenth Century Stars (Kansas City: Society for American Baseball Research, 1989). John Liepa, “The Cincinnati Red Stockings and Cal McVey, Iowa’s First Professional Baseball Player,” Iowa Heritage, 87:1 Spring 2006.